Portland-based firm Caleb Johnson Studio has unveiled a beautiful cedar-clad home elevated off the ground on stilts so that the natural “landscape is allowed to flow under the house.” The solar-powered home, named “In the Dunes,” was designed to not only protect the natural dune terrain, but the resilient design also reduces the risk of damage caused by potential coastal flooding. 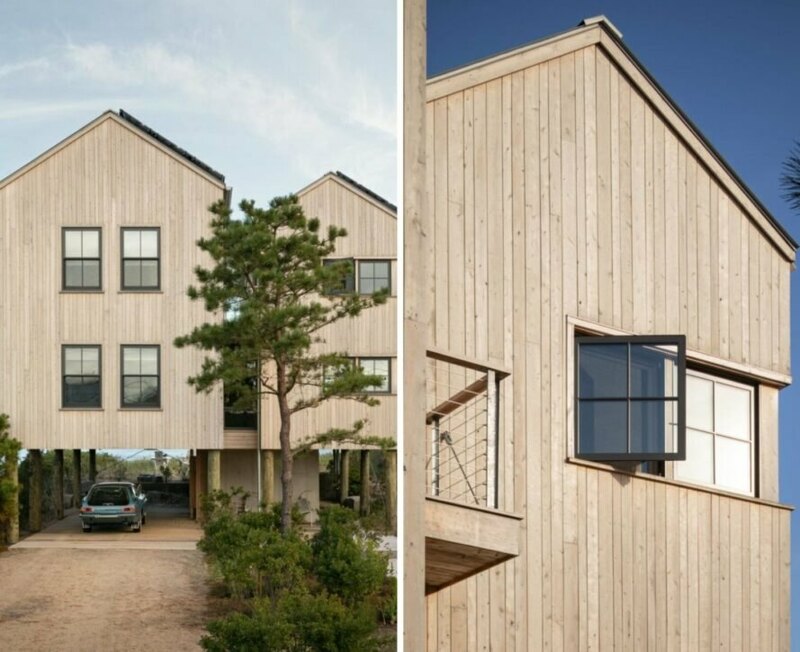 Located in the coastal town of Wells in southern Maine, the three-story home is built on sand dunes overlooking the Atlantic Ocean. 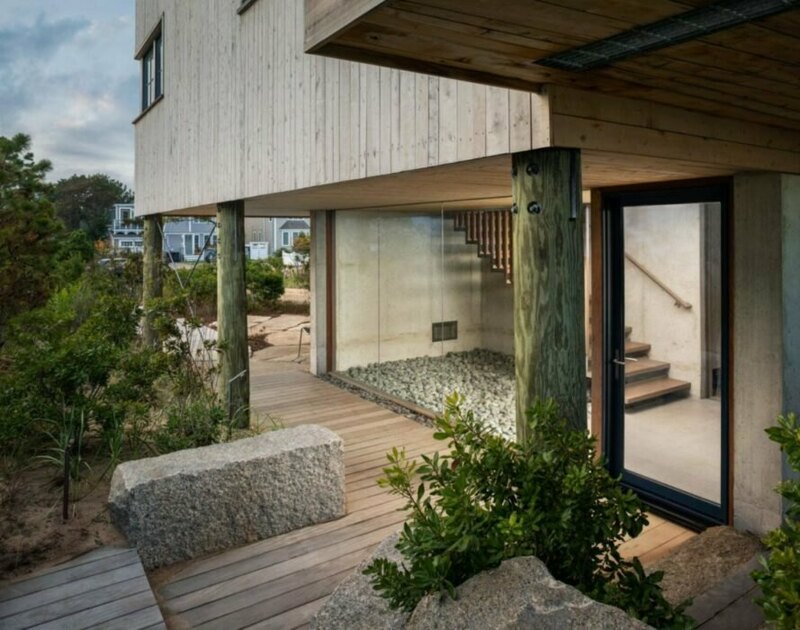 Due to instability of the dune landscape, the architects decided to elevate the home off the ground by large wooden stilts built into a concrete plinth. According to the firm, this was a strategic decision to allow the landscape to continue in its natural state under the home. It is also a resilient feature to protect the home from coastal flooding. With its cedar cladding, pitched roofs (installed with solar panels) and multiple large windows, the home certainly manages to blend in with its natural surroundings. On the interior, the space is also focused on the incredible views. 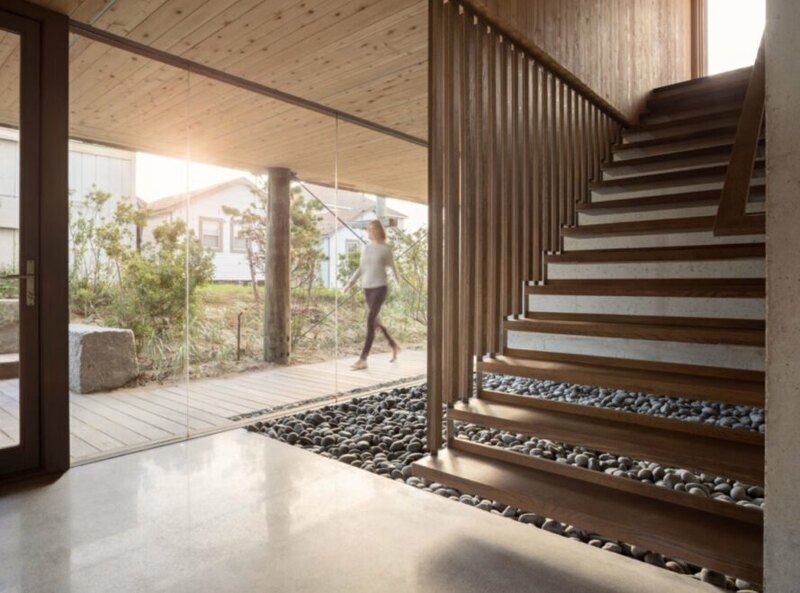 The ground floor is marked by the large wooden stilts that form a pleasant, open-air space, which wraps around the home with a wooden pathway leading the way to the glass-enclosed entryway. From the front door, a large window surrounded by natural stones leads up to the upper floors. Once inside, an abundance of strategically placed windows provide panoramic views from nearly any angle. An interior design comprised of a neutral color palette and minimal furnishings creates an incredibly welcoming home. 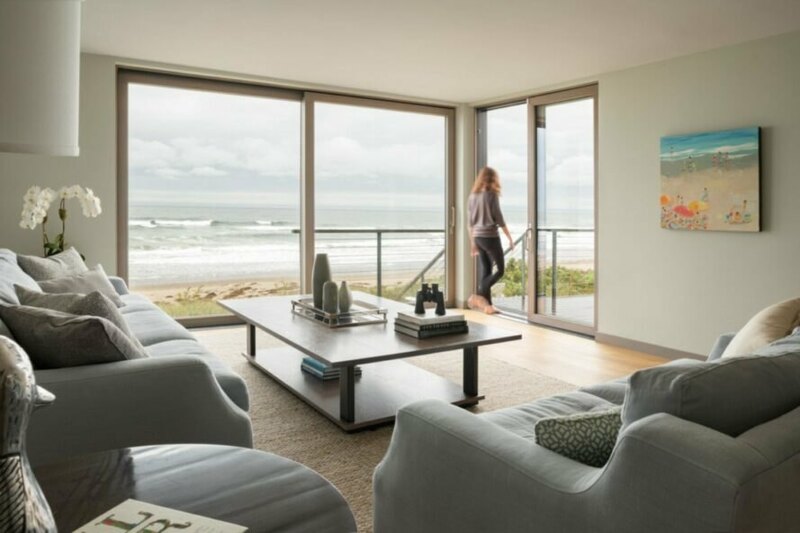 The "In the Dunes" home was designed by Caleb Johnson Studio. Clad in cedar panels, the home blends into the natural landscape. The first floor is used as a garage and storage area. A large glass-enclosed entryway welcomes the residents into the home. A large walkway was built under the home, creating an open-air space. The open layout is enhanced by ample natural light. Large glass panels provide stunning views. Modern touches and minimalist furnishings put the focus on the views. 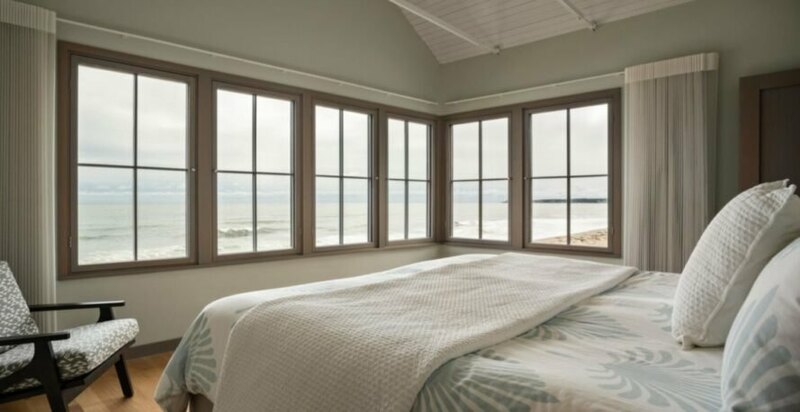 The views can be enjoyed from every room. 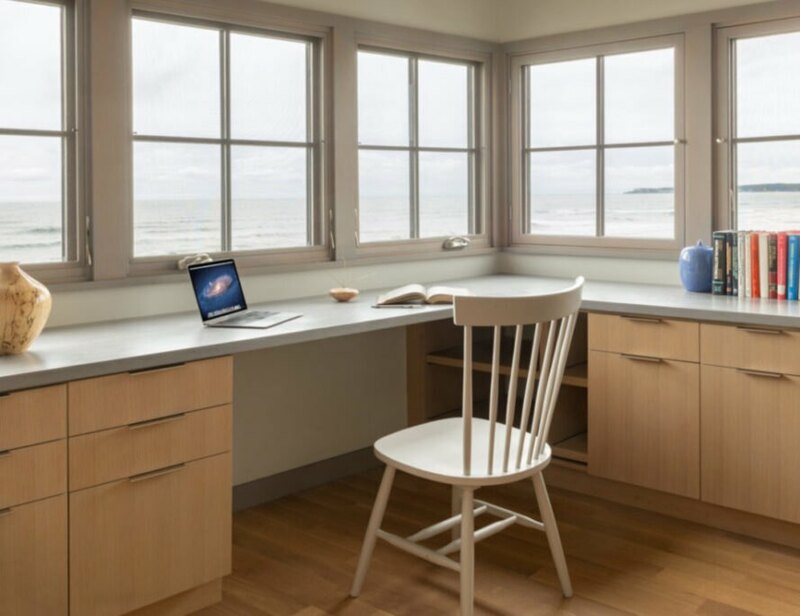 A serene office space is ideal for working or relaxing with a good book. 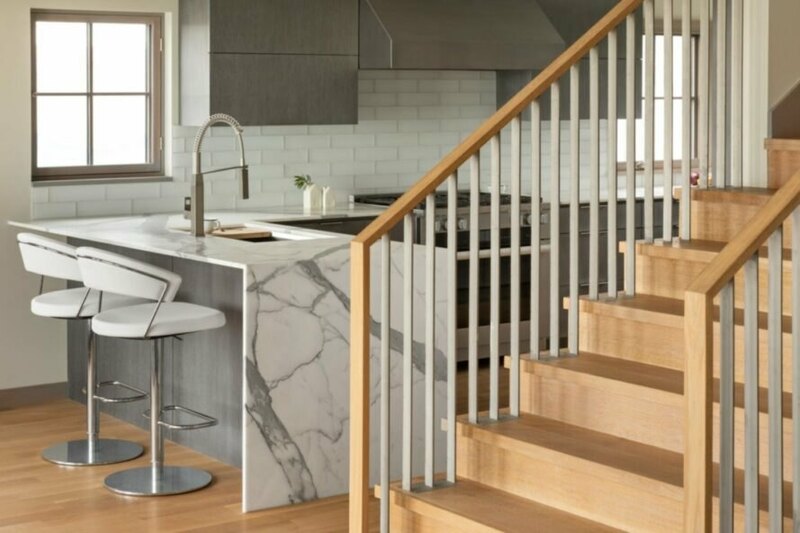 Modern touches bring a contemporary cottage feel to the design. The open ground floor serves as a garage.